Joining Ginny’s Yarn Along for this week again. This week has been quite successful knitting and crochet wise. 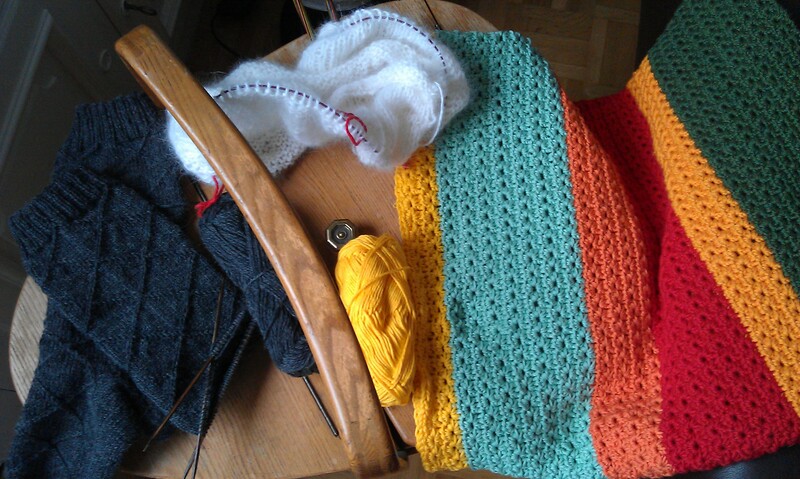 You can see how much my Sofa Blanket has grown: I finished the first third of the stripes. And one sock of my Business Casual socks is finished, the other one ready to turn the heel. Only my topdown sweater is not growing as much. I’m not too sure whether I should really go on with this project or whether I should just put it aside or even frog it and start something else. As it comes to reading, I have nearly finished Little Miss Undercover and have just another 200 pages or so to go in A Feast of Crows. Now to something else: And after seeing it at Marigolds’ Loft I decided to take part in Knitting and Crochet Blog Week IV which starts on Monday. I might not write about all topics but I try to tackle as many topics as possible. It is really exciting. I already prepared drafts for several topics and for the first time counted and kind of catalogued my stash. This was a bit scarry too: Overall I have about 10kg of wool stored all over our living room with only very few yarns already having a purpose. But that is just a sidenote. I hope to see you all during Knitting & Crochet Blog Week and hope you all join! This entry was posted in Knitting & Crocheting and tagged Blanket, Crochet, Knitting, Knitting & Crochet Blog Week IV 2013, Socks, Yarn Along by kathatravelling. Bookmark the permalink. I just nominated you for the Leibster Award – I really enjoy reading your blog and think other people will too! Check out my latest post for more information. Wow, just discovered Yesterday what the Liebster Award is. Thank you! that sofa blanket is awesome. looking forward to seeing it completed. Thanks for stopping by. I like the idea of Knitting & Crochet Blog Week. It already got me thinking a bit. It’s like back in school: you get assignments and have a set date to finish them. Ok, good that they don’t get graded but I like the challenge you can turn them into.